They investigated the effects in the mice of the order of these mutations, and found epistatic interactions; the order in which the mutations occur matters. 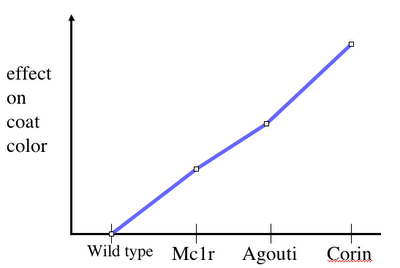 In other words, Corin and Agouti (or Mc1r) interacts to produce a higher effect on color (and thus fitness) than each one has on its own. Epistasis. However, then Hopi made a strange assumption. She then assumed that each mutation must have an effect on fitness, and that in the order of mutations, Corin must necessarily come last. I still haven't caught at the meeting, but when I do I'm going to ask why she makes this assumption. 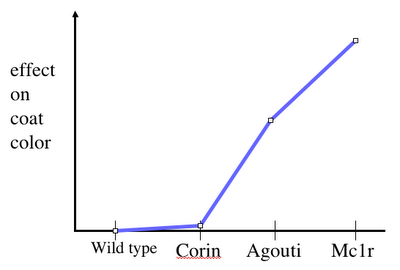 Since the effect of Corin alone is effectively neutral, there is nothing wrong with it coming first in the ancestral line that includes all three mutations. Update 5/31: At the picnic I spoke to Hopi about the matter (btw, she's of Dutch ancestry, so her name is unpronounceable to Americans, but instead goes by Hoe-sktra, as in "that ho(e) is extra good"), and she told me that she agrees that the mutations could indeed come with Corin first (or second), but that the emphasis is not on the order of mutations, but on the order of selection pressures. Additionally, the story is more complicated than what she could present in 20 minutes (that undoubtedly goes for all 75 (or so) talks). There are subpopulations with only two of the three mutations. Which ones were they? Sorry, I don't recall. There were five different populations. Check out her publications.